The word I drew from my word jar yesterday was Cycle. I started by pulling a bunch of green fabric scraps. The idea of “cycle” just made me think of green for a bunch of reasons. For one, when I am out cycling these days there is SO much pretty green trees and plants. My allergies don’t care for it much but I love looking at all the beautiful green. As much as it rains here, and I get tired of all the rain, it still makes our area so lush and beautiful. Another reason that green came to mind is the idea of cycles meaning growth and the seasons. Right now we are in the growing, green season. My garden is filled with green. 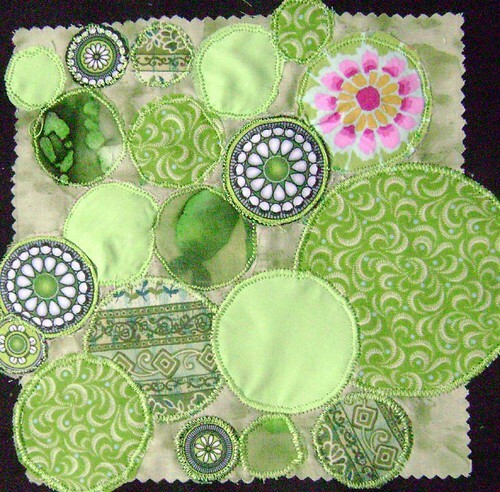 Then I cut all the green into circles. Circles make me think of my tire wheels… that are part of my bicycle. Also the idea of a cycle is that it comes back around from start to finish, so a circle is the perfect symbol for it. After I laid out the circles I decided they should become pea pods. The peas are one of the main crops I can harvest right now so there are lots of them around. But I was also thinking about the protective shell around the peas. I am in a fun, but sometimes difficult cycle of my year right now. As a teacher I have the summer to reflect, relax and rejuvenate. But without any structure I tend to get lost and antisocial and even depressed. This year I am working on creating a protective shell around myself and my goals to provide some structure. 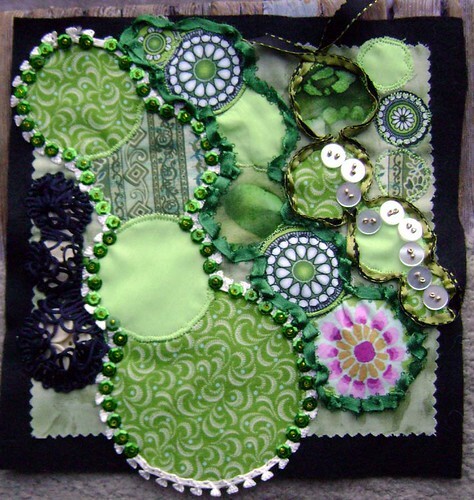 Using beads, ribbon and trim I grouped the circles into some pea pods. I added some buttons too as little peas within some bigger ones. I also like how the white trim with the green sequins ended up looking like a bike chain. I meant for this to be a quick one day per word type challenge. More of a doodle art starter type thing. But I really enjoy hand sewing/beading work, which takes a lot longer. I am thinking actually that this might meld into my Beaded journal Project piece, since I am behind on those and really this is pretty much the same idea as the BJP. Sometimes it is hard for me to decide when a piece is done, when to stop adding to it. But I feel good about this one. Although I still have to figure out how I want to ‘finish’ it for display purposes. That part seems to hold up a lot of my pieces, so they end up just sitting around in piles in these not ready to display states. This entry was posted in Bead Journal Project, Challenges, Fiber Goodness, Passions and tagged cycle, inspiration, words on June 30, 2010 by Sheba.